Looking to compare Charles Tyrwhitt vs Brooks Brothers shirts? Below you’ll find Charles Tyrwhitt reviewed and compared with Brooks Brothers shirts. The review covers the prices, quality and sizes of Charles Tyrwhitt vs Brooks Brothers shirts and contains detailed garment size information unique to this website. You can purchase Brooks Brothers and Charles Tyrwhitt direct from the retailers by clicking on the images below. Charles Tyrwhitt shirts are usually cheaper than Brooks Brothers. Brooks Brothers typically charge around $90 for a shirt in the US. On their UK website they are charging around £120 to £160 for their shirts. If you are shopping from the UK I recommend you switch to the US site and compare prices, taking into account shipping. Charles Tyrwhitt’s prices vary a lot, but there are almost always deals such as 4 for £100 or shirts for $29.50. Customers rarely pay full price for a Charles Tyrwhitt shirt. Any pricing data I put here would soon be out-of-date. Instead click the sales and vouchers page for for the latest discount and voucher code information. Brooks Brothers often have sales related to the US holidays, like Labor Day, so if one of them is coming up it may be worth delaying your purchase. One area where Brooks Brothers shirts are superior is the non-iron. New Brooks Brothers non-iron shirts are superior to new Charles Tyrwhitt non-iron shirts – if you judge them by the amount of ironing you need to do. When I took my Brooks Brothers shirts out of the washing machine I could put them on a hanger and they dried wrinkle free. I couldn’t do that with my Charles Tyrwhitt non-iron shirts, even when I first bought them. However, having now washed the Brooks Brothers shirts more than half a dozen times I need to iron them like any other shirt and there is little difference between the two brands. Brooks Brothers have a worse returns policy than Charles Tyrwhitt. Charles Tyrwhitt have a great returns policy: six month no quibble refund policy. 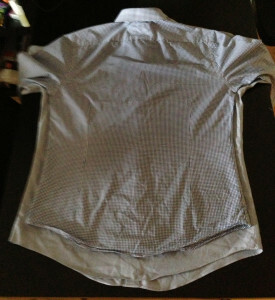 Brooks Brothers will accept a return if the shirt is in the original condition within 60 days. The four tables below will let you compare the different shirt sizes of Charles Tyrwhitt vs Brooks Brothers. All sizes are in inches and all the measurements are garment sizes. As an introduction, the picture below compares Charles Tyrwhitt vs Brooks Brothers differences on width and length between a Charles Tyrwhitt extra slim fit and a Brooks Brothers Regent shirt, for a 16.5 inch collar size. As you can see, the Charles Tyrwhitt is much shorter. On the sides the gap between the Brooks Brothers and the Charles Tyrwhitt is just over an inch, so that means the total difference in five inches, which fits with Table 1 below (50.5 inches vs 45.5 inches). In terms of chest sizing, the ordering of the different cuts is given in Table 1 below and a comparison of the chest sizes is given in the chart below. The two fits which are closest are the Charles Tyrwhitt Slim Fit and the Brooks Brothers Milano Fit. The detailed chest size numbers are in the table below. In terms of waist sizing, the ordering of the different cuts is given in Table 2 below and a comparison of the waist sizes is given in the chart below. The detailed waist sizes are in the table below. More detailed comparisons are given in the tables below. Table 4 – Slim Fit Fit Charles Tyrwhitt vs Brooks Brothers Madison Fit. Table 5 – Extra Slim Fit Charles Tyrwhitt vs Brooks Brothers Regent Fit. Table 6 – Super Slim Fit Charles Tyrwhitt vs Brooks Brothers Milano Fit.